Usually, I avoid films starring Sarah Jessica Parker. But I couldn't resist this one, mainly because it also stars Zooey Deschanel, Bradley Cooper and Justin Bartha. Also, Matthew McConaughey, who I still can't forgive for Ghosts of Girlfriends Past. McConaughey plays Tripp, a 35 year old still living with his parents. 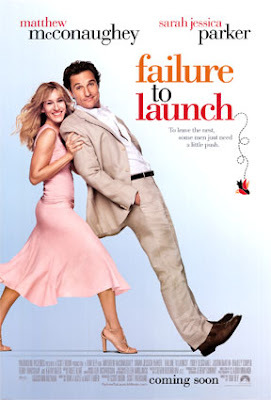 When his parents decide it's time for him to move out, they hire Paula (Parker), a woman who pretends to be in love with him so she can get to him to live somewhere else. And of course, mayhem ensues. So McConaughey and Parker don't deliver the performances of their careers, but Zooey Deschanel is a particular stand out. Mainly because she's funny as the straight-talking Kit, who has some wild and violent mood swings, thanks to a mockingbird chirping outside her window. Bradley Cooper, of course, is both hot and marvellous, like always. And Justin Bartha, well, he's different. In a good and funny way. Though this isn't perfect, it's still mildly funny and provides a few laughs to keep entertained. However, it hasn't changed my opinion on McConaughey or Parker. Only watch if you're really bored, but especially if you love Zooey Deschanel, the true star of this movie.